The legendary Fred Beckey passed away today at the age of 94. His contributions to the outdoors have been immeasurable, and he will be greatly missed. Off belay, Fred. Fred Beckey, a legend among Northwest Mountaineers, and a climber, environmentalist, historian, and Mountaineers Books author, passed away on October 30, 2017. He was 94. Fred achieved enduring recognition as the most imaginative, persistent, and thorough explorer and mountain investigator of the Cascade Range Wilderness. He wrote the original guidebooks for the North Cascades (the Cascade Alpine Guides), and is noted as “one of America’s most colorful and eccentric mountaineers." He's unofficially recognized as the all-time world-record holder for the number of first ascents credited to one man. He started climbing in the Boy Scouts and continued as a teenager with The Mountaineers, graduating from our Basic climbing course. In 1939 he joined REI co-founder and Mountaineers climb leader Lloyd Anderson on the first ascent of Mt. Dispair. Fred was 15-years old. "I was 13 when I climbed Boulder Peak in the Olympic Mountains by myself—and I guess you can say that I never stopped climbing after that. For me, the appeal of climbing has many sources: a longing to escape from the artificial civilized order, a need for self-rejuvenation, a desire to restore my sense of proportion. When you are climbing, you experience freedom from constraints." In 1942, and 19 years old, Fred and his brother Helmy shocked the climbing world by making the second ascent of Mount Waddington in the British Columbia Coast Range. Fred went on to establish one of the world’s most impressive records of first ascents. His climbing exploits would become the stuff of legend. His unblinking focus on the summit became something of a Beckey trademark. Fred was born in the suburbs of Dusseldorf, Germany on January 14, 1923. Times were hard, if not desperate, and his father, Kalus, a physician and surgeon, and his mother, Marta Maria, an opera singer, decided to immigrate to Seattle in 1925. As a boy he hungered for something that would engage his mind and make Herculean demands of his body. Fred invented the climbing life and showed us how to live it. He's credited with being the original "dirtbag climber". Over the course of seven decades, Fred would amass more first ascents than anyone else on earth and author books that are considered classics of mountaineering literature. Fred published his first book with Mountaineers Books, a Guide to Leavenworth rock-climbing areas, in 1965 and went on to author the Cascade Alpine Guide series (V1, V2, V3). Fred is also the author of Mountains of North America, The Range of Glaciers: Exploration and Survey of the North Cascades, Mount Mckinley: Icy Crown of North America, and a personal narrative, Challenge of the North Cascades. In 2015, we recognized Fred by presenting him with The Mountaineers Lifetime Achievement Award at our annual Mountaineers Gala. Mountaineers Books plans a biography of this larger-than-life Northwest legend; a publication date has not yet been announced. 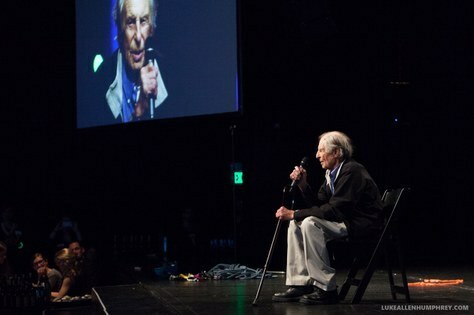 His life was recently chronicled in the film DIRTBAG: The Legend of Fred Beckey. 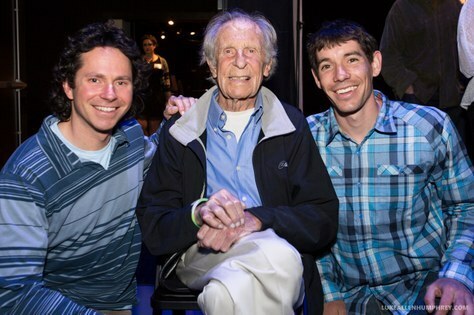 Fred at the 2015 Gala, with climbers Colin Haley and Alex Honnold. FRED BECKEY AT THE MOUNTAINEERS SEATTLE PROGRAM CENTER ON OCTOBER 10, 2016. PLANNING TRIPS, REVISING HIS MANUSCRIPTS, AND WORKING ON HIS SECRET TICK LIST OF CLIMBS. BY SUZANNE GERBER. 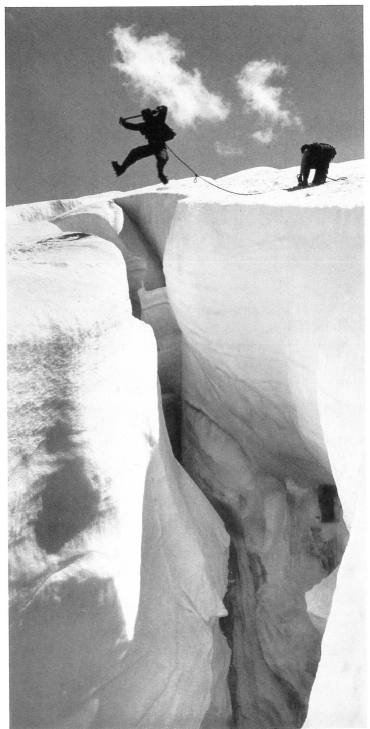 In 1942, brothers Helmy and Fred Beckey shocked the climbing world by making the second ascent of Mount Waddington in the British Columbia Coast Range. They did this by simply hiking in and climbing the peak as if it were a nearby Cascades summit, despite earlier attempts by experienced teams in the years since the peak was first climbed in 1936. 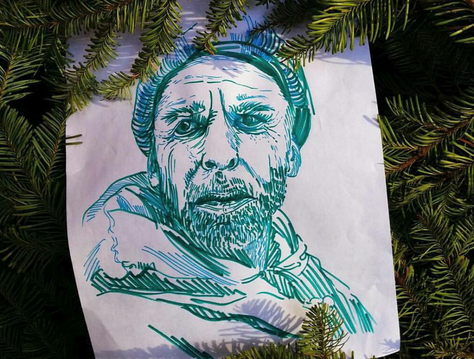 Fred Beckey, who would go on to establish one of the world’s most impressive records of first ascents, was nineteen at the time. His younger brother had just turned seventeen. Walt Varney described one of the early climbs in the 1943 annual, an ascent on Kangaroo Ridge in the Washington Pass area of the North Cascades: “Mushroom Tower, 8,400 feet, could have no other name because it was just that. A stratum of soft rock has worn out, leaving the dome sitting on a thick column with an overhanging pitch all around. It appears unclimbable except in one spot. And this pitch,Fred and Helmy insist, is the toughest one they have ever climbed. 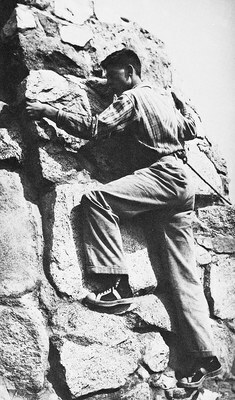 Descriptions of climbs in previous Mountaineer annuals had seldom noted the exact techniques climbers used, probably because no real technique was involved. But from this point on it became almost a matter of pride to list the techniques employed, especially in accounts by Fred Beckey. After graduating from the University of Washington, Beckey pioneered a lifestyle that revolved around climbing, at times living out of the trunk of his car as he drove around the country in a quest for new climbs and new partners. Many climbers have followed Beckey’s inspiration over the years, embracing this nomadic lifestyle for the sake of climbing. 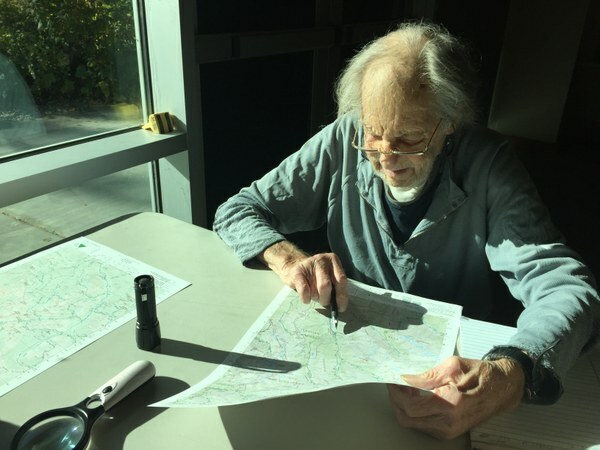 Aside from his climbs, Beckey’s crowning achievement has been his three-volume Cascade Alpine Guide, now published by Mountaineers Books, which evolved out of his earlier book, the Climber’s Guide to the Cascade and Olympic Mountains of Washington. The Cascade Alpine Guide remains indispensable for anyone climbing in the Cascades. End of an era. Irascible, unstoppable Fred. A mountaineering legend. What an inspiration this man has has been for me, and I'm sure everyone who has met him. His guide books have a special shelf in my house. We will miss you my friend. You continue to touch people's lives in a positive way. Fred Beckey showed us how to live a life truly in love with the mountains, and that Mountaineers can in fact live to see old age. Fred, may the mountains on the other side be ever higher, and may the ranges go on forever so that your soul may rest in peace. Thank you Fred for your life and the inspiration you gave us all. Rest in peace awhile and then go climbing with us again. I will be looking out for you. Happy trails Fred! How delighted I was to score a "Beckey" at a second hand bookstore in 1980 after having only photo copies on an early 70's climbing trip to N Cascades from Ohio. Thanks for many lifetimes of dreams, Fred.